"Every Good Tree Bears Good Fruit"
The key to a successful marriage is putting your spouse’s needs ahead of your own. Here are 25 practical suggestions gleaned from 25 years of happy marriage. Don’t make her guess what you are thinking or feeling. Your wife is wonderfully unique. Don’t compare her to your mom, or your ex-wife, or your old girlfriend. Your mom may make the best chocolate chip cookies in the world, but unfavorable comparisons won’t win you brownie points. It’s likely just a few steps from wherever you are dropping them anyway. Make this a habit, and it will let your wife know your don’t consider her your personal maid. We all have to keep an eye on our budget, but an occasional splurge can be well worth it. Seemingly frivolous things like flowers, jewelry, and overpriced restaurants let her know that she is more valuable to you than a number in your bank account. It is amazing how meticulous guys can be prior to marriage in their attempts to impress a girl, but once they walk down the aisle, all bets are off. Clean up a little; I promise it won’t kill you. Invariably there will come times in your relationship when you will be forced to choose between your wife and something else that you enjoy. Always choose her. There are lots of ways to show your love, but women still like to hear it spoken. Obviously no list is comprehensive, and one size certainly doesn’t fit all, but hopefully this one will prompt you to compile a list of your own, tailor-made for your own wife. 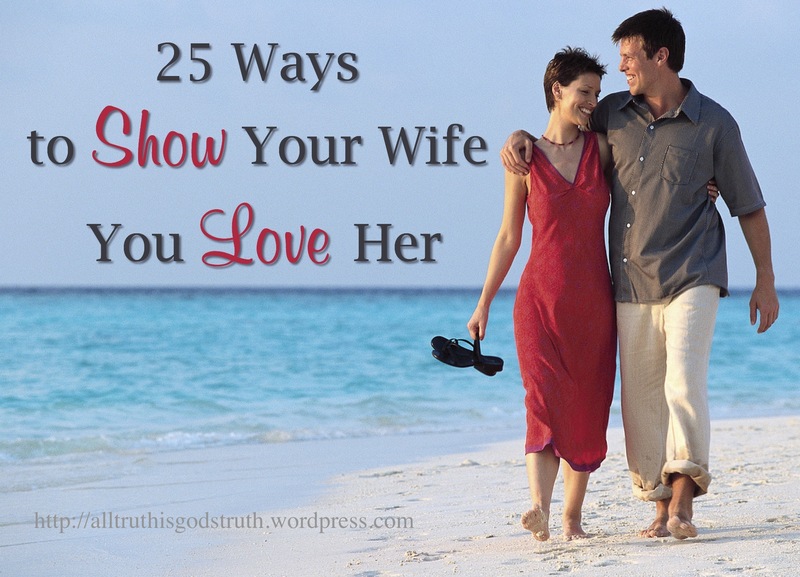 For any women reading this blog, you may be interested to know that my wife has published a similar list entitled 25 Ways to Show Respect to Your Husband. Check it out and let me know what you think. Also, for those who have requested printable versions of these articles, you’ll find the list for wives here and the one for husbands here, with an option to print either article in its entirety or as a one-page summary. 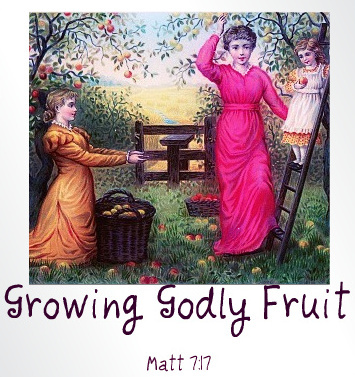 When we talk about being godly women, we go to Proverbs 31 or Titus 2 for our instruction. But there isn’t a “Proverbs 31 man”. So where do we go to find what the Bible says about being a godly man? In Voddie Baucham’s sermon “The Four P’s: Is He Ready To Lead”, we find that the Bible has a lot to say about what being a godly man looks like in Titus 1:5-16. 5 For this reason I left you in Crete, that you should set in order the things that are lacking, and appoint elders in every city as I commanded you— 6 if a man is blameless, the husband of one wife, having faithful children not accused of dissipation or insubordination. 7 For a bishop[b] must be blameless, as a steward of God, not self-willed, not quick-tempered, not given to wine, not violent, not greedy for money, 8 but hospitable, a lover of what is good, sober-minded, just, holy, self-controlled, 9 holding fast the faithful word as he has been taught, that he may be able, by sound doctrine, both to exhort and convict those who contradict. The Bible says that one of the consequences of not following these guidelines is that a husband/father will not have his prayers be heard. What are the Four Ps? The first qualification of an elder includes; modeling a godly family life. (Titus 1:6) Paul says that this man must be “the husband of one wife” meaning he must be a one-woman kind of man. He also says that “his children are believers and are not open to debauchery and insubordination”. In his sermon Dr. Baucham believes that, “his children are faithful” is the best translation for this particular section of this verse. No father can guarantee the conversion of his children, but he can ordinarily ensure that they act in a “faithful” way. Therefore this qualification is not focusing on his children’s disobedience, but rather how he reacts to the child’s disobedience. Overall this man must have one wife and faithful children in order to qualify as a potential elder. “He must not be arrogant or quick-tempered or a drunkard or violent or greedy for gain…” (Titus 1:7) If a man is above reproach then, the aforementioned deeds would less likely be seen in his character. What you would notice about him is that he strives to be “… hospitable, a lover of good, self-controlled, upright, holy, and disciplined.” (Titus 1:8) The attributes for sons and potential spouses for daughters shouldn’t be far off from these. The last qualification of an elder is; to hold to, teach, and defend sound doctrine. (Titus 1:9) ”A pastor or elder must have the ability to teach. This includes both teaching what is right and correcting error. The reason for this emphasis is clear from what follows in verses 10-16.” (Titus:9) As Dr. Baucham put it, many may think that this particular characteristic doesn’t apply to parents raising sons but it does. If a young man is holding firm to the word of God, defending it, teaching it, and all the while applying it to his life, the other qualifications (such as verses 7-8) will fall in place. Dr. Baucham says in his sermon, that a Christian man’s job is to wash his wife in the water of the word (Eph. 5:26) and bring his children up in the discipline and instruction of the Lord (Eph. 6:4). Ultimately these qualifications, characteristics/character traits are important for every Christian man, not just elders. Paul wanted Titus to go to the home, find an ordinary family man who is walking out the Christian life as a husband and father and then appoint him as an elder in the church. By reading the Old Testament we can learn a thing or two from the Patriarchs and many other men who did their duty as a husband and a father. For sure. But he can learn to be a gentleman as well. A gentleman in the right sense – not in a sissy, unreasonable manner – but a kind, respectful and godly young man. It’s not that we’d ask our son to sit with his hands folded or keep him from running, building or exploring. No way. But we do hope he’ll learn to be wise, to consider others, and to remember that he’s a son of the King. Control your temper. “He who is slow to anger is better than the mighty. And he who rules his spirit than he who takes a city” (Prov. 16:32). Keep your word. A gentleman follows through on what he says he will do. Don’t hang out with the ungodly. Bad company corrupts good morals. I Cor. 15:33. Invest in strong, loyal friendships. The kind of friend who “sticks closer than a brother” (Prov. 18:24). Do what needs to be done. Without being told. Don’t wait to be asked when you know what you should do. Look sharp. Not sloppy or slovenly – simply neat and clean will do. Don’t chafe at correction. Consider it an opportunity to learn and grow. Prov. 3:11. Be known as a hard worker. Learn to enjoy your job and take on whatever must be tackled. Prov. 6:6. Walk in purity. Avert your eyes and run from immorality. There is power in purity. Work out. Keep in shape. A young man should be strong and fit for whatever he might be called upon to carry out. Watch over those who are younger or weaker than you. Never be too big for the small. Serve others. To humbly serve is a very manly quality. Don’t let anyone ever tell you differently. Follow Christ’s example. (Phil. 2). Look after the ladies. Step back to let her in the door first. Offer to carry heavy items for her. Protect and defend her. Make study a life-long habit. Commit to learning as much as you can about as many subjects as you can. Read books, research, observe and ask questions. Show respect for those who are older than you. Look them in the eye and shake their hand. Listen to what they have to say. Flee from sin. Get out of there immediately when you encounter temptation. (I Tim. 6:11). Be bold. As a lion. A righteous man doesn’t need be shy about what’s right. Prov. 28:1. Love God’s Word. Blessed is the man…whose delight is in the law of The Lord. Psalm 1. So yes, boys will be boys. 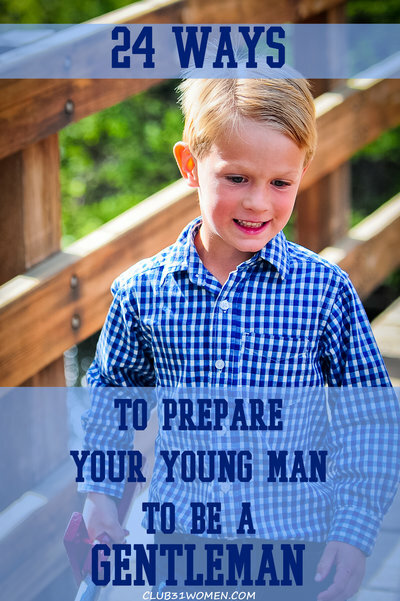 But prepare them to be gentlemen too. –The notion that motherhood is a worthwhile investment of a woman’s time suffers unrelenting bombardment. –And the idea that wives should yield to the leadership of their husbands, as commanded in Ephesians 5:21–33 is considered almost medieval in its stupidity. –And the concept that a man and woman should become one flesh, finding their identity in each other rather than as separate and competing individuals, is said to be intolerably insulting to women. –And the role of the female as help-meet, bread-baker, wound-patcher, love giver, home builder, and child-bearer is nothing short of disgusting. Let me say it more directly. For the man who appreciates the willingness of his wife to stand against the tide of public opinion–staying at home in her empty neighborhood in the exclusive company of jelly-faced toddlers and strong willed adolescents–it is about time you gave her some help. I’m not merely suggesting that you wash the dishes or sweep the floor. I’m referring to the provision of emotional support…of conversation…of making her feel like a lady…of building her ego…of giving her one day of recreation each week…of taking her out to dinner…of telling her that you love her. Without these armaments, she is left defenseless against the foes of the family–the foes of your family! But to be honest, many of you husbands and fathers have been thinking about something else. Your wives have been busy attending seminars and reading family literature and studying the Bible, but they can’t even get you to enter a discussion about what they’ve learned. You’ve been intoxicated with your work and the ego support it provides. What better illustration can I give than the letter quoted on page 94. It came from a desperate woman whose husband is rarely at home, and even when he’s there he has nothing to say. He prefers the company of Paul Harvey, who asks no questions and expects no answers. Furthermore, he’s a first-class punkin eater.” You know the story. And there he kept her very well…. Yeah, Old Pete has got his little woman right where he wants her. She’s cooped up in a house with two children under three years of age, changing diapers and wiping noses and cooking meals for him and Mr. Harvey. That’s some existence for living, breathing, female with deep needs to be loved and respected. Not only does Peter not intend to meet those needs, but he forbids her to take them elsewhere. He doesn’t even want her to go to a Bible study class because, would you believe, he fears his kids will catch a disease. Never mind the disease that is choking the life out of his wife—the disease called loneliness. To the wives of all the world’s punkin eaters, I say, “Go to the Bible study class anyway!” Submission to masculine leadership does not extend, in my opinion, to behaviors that will be unhealthy for the husband, the wife, and the marriage. Nor should a woman tolerate child abuse, child molestation, or wife beating. The message could not be more simple or direct to a Christian man: the Lord has commanded you to “love your wives, even as Christ loved the church, giving His life for it.” She needs you now. Will you fit her into your plans?